Dentures must provide a maximum of aesthetic quality to improve your self-confidence and, consequently, your social life! Dentures that are too old and that have poor aesthetic quality can make you look much older that you are. When they are too sunken in and the teeth are not very visible, they make the person look older. It’s very important to provide for sufficient lip support when crafting dentures. Ever notice how the natural teeth of a young person are always more visible than those of an older person? The lack of visibility of the older person’s teeth is due to the wear and tear of the natural dentition and sagging of the muscles around the mouth. From an aesthetic perspective, it’s easy to rejuvenate a person’s appearance in a short period of time by hand crafting beautiful, properly positioned dentures. However, it goes without saying that it’s just as important to tend to the denture’s functional features. Implants are not always a possibility for some people so precision dentures are usually the next best option. Precision cosmetic dentures, or equilibrated dentures, are designed with special attention to provide the most natural-looking aesthetics. They also follow your specific anatomic chewing movements as much as possible. Precision cosmetic dentures are therefore more stable and allow for quicker adaptation and greater comfort. They are strongly recommended to all denture wearers, especially those whose lower ridge is more severely resorbed, or who suffer from cracking and joint pain in the jaw. At Lima Denture and Implant Solutions, we create these types of dentures only, utilizing superior products from companies such as Ivoclar BPS, Swissdent, and others. We recommend changing or replacing your conventional dentures every 5 to 7 years however it is not uncommon for patients to have their dentures changed or adjusted after 2 to 3 years for hygienic or esthetic reasons. For confidence and security in your smile, contact our denture clinic to schedule your free, no-obligation consultation. The replacement of individual lost teeth as soon as possible after the loss of the tooth is critical for the maintenance of optimum oral health. When a natural tooth is extracted and not replaced, the remaining teeth tend to drift closer together into vacant space. They will fill the gap left by the extraction over time. This movement can create problems with the overall bite, or occlusion of the patient’s remaining teeth, leading to more difficulty eating, hygiene, and possible jaw joint problems. This is the function of the precision partial denture – to restore esthetics, and chewing function and maintain proper spacing. Whenever dental implants are not a viable option for you, the removable partial is the next best option. There are different types of partial dentures, those that are of all resin or plastic construction and those that are precision cast in a metal such as titanium. The all plastic partial denture is generally considered to be only a temporary option while the precision cast partial is much more precise fitting and is more esthetic, hygienic, and gentler on the oral tissues. Dental implants are long-lasting tooth root replacements that oral surgeons implant into the jawbone to simulate the root of a pre-existing tooth. For qualified patients, replacement teeth then can be restored immediately, returning a spectacular smile quickly. Dental implants don’t move or shift and they can last a lifetime. An implant-supported denture is supported and attached to implants. Implant-supported dentures are used when a patient doesn’t have any teeth in the jaw but has enough bone in the jaw to support implants. An implant-supported attachments on the implants denture has special attachments that snap onto attachments on the implants. Implant-supported dentures are usually made for the lower jaw because regular dentures tend to be less stable, however they may be used in either the upper or lower jaw. Implants are fixed in place and do not move. Therefore, there is no slipping or clicking as with dentures. Dental implants have proven to be reliable, with a 95% or higher success rate. The success of dental implants is supported by decades of clinical experience and hundreds of thousands of satisfied patients. With dental implants, you avoid the potential pain and embarrassment of dentures. There is no fear of slipping or falling out, no need to avoid activities, no need to restrict what or how you eat, no wire in your mouth, no plastic on the roof of your mouth. Many people with dental implants say they just live better than they did when they had dentures. Natural teeth preserve the jawbone. When a tooth is lost, the bone around the missing tooth begins to erode and weaken. Over time, this can result in the loss of other teeth, and the overall deterioration of your dental health. When many or all your teeth are missing, the jawbone can experience significant atrophy, resulting in a facial features that look “sunken”. People with dentures often look older and less attractive because of this bone loss. Conventional bridges and dentures do not address the problem of loss of bone in the area where teeth are missing. Dental implants can avoid the potential bone loss problems caused by bridges and partial dentures. Because dental implants are anchored into the jawbone and do not rely on surrounding teeth, they perform naturally and promote a healthy bone. When a missing tooth is replaced by a dental implant, the fusion (or osseointegration) of the implant and bone provides stability, just as the natural tooth did. When missing all of your teeth, dental implants stimulate the bone, protect against atrophy, and help preserve your natural facial features. At Lima Denture and Implant Solutions Clinic we work with only the finest surgeons and specialists for the implant preparation and placement process leaving the artistry and technical processes of the prosthetic restoration to the experts in our clinic. There are two different types of restorations in regards to dental implants: fixed and removable. A fixed prosthesis can not be removed by the client. A removable prosthesis can be removed by the client. 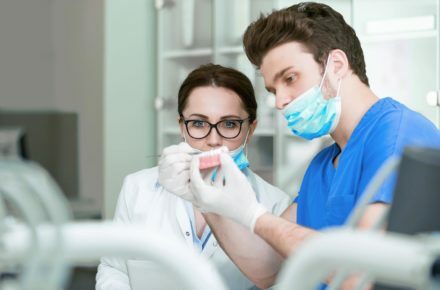 Clients are encouraged to speak directly to one of our denturists to determine the best option for them.